What is Fine Motor Boot Camp? What are you doing to address fine motor, language and academic needs in young children? 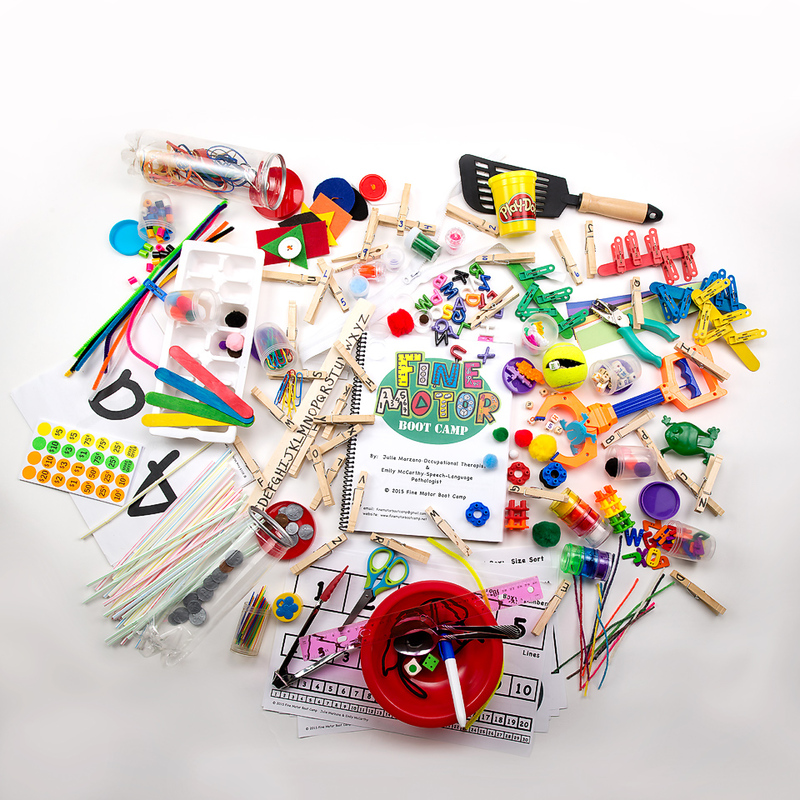 "Fine Motor Boot Camp" was developed to meet ALL of these targeted needs in only 5-15 minutes a day, using inexpensive, household/ office items. Developed by a Speech-Pathologist and Occupational Therapist, this play-based program can be implemented by anyone, anywhere. Open the box and begin! There is ZERO PREP & PLANNING when you purchase the total program. We have done the work for you. Teachers and parents are often “left in the dark” when it comes to fine motor and language interventions they can practice on their own. Fine Motor Boot Camp was developed as a inter-professional program that ANYONE can implement. Given the rise of direct instruction and electronics with a decrease in outdoor, hands on play, children have less opportunity to increase their fine motor and language skills. Our program was developed to fill this gap. Be sure to follow us on Instagram, Vimeo, Twitter and Facebook! “The Fine Motor Boot Camp system is the perfect combination of simplicity, efficiency and fun. The thoughtfully planned (reusable) kits (containing a language and fine motor activity which highlight concepts such as colors, numbers, activities of daily living, cutting and letters) are small and can easily be stored, packed and carried. The kits are made out of readily available and inexpensive materials that can be quickly reproduced if needed. The children are using "real life" objects that they find so fascinating, such as paint stirrers, clothes pins and buttons. The program also includes “challengers” and “simplifiers” for each activity to ensure that ALL children are successful and challenged." Please note that the products and the information presented on this website and linked social media are not replacements for evaluation/ treatment of Occupational or Speech Therapy services. The information on this website is provided as general information only and is not intended to provide specific medical advice for any individual and should not be used for that purpose. If you have concerns regarding your child's development, please contact his/ her pediatrician for further information. In addition, These activities are designed to be done in a highly supervised setting. This website is the opinion of an individual and is not to be construed as professional advice or a professional relationship between the reader and the writer.